In 1991 Anne and John Phillips and their four boys moved from their 800acre Biodynamic mixed farming property at Mayrung in NSW to a 100acre farm bordering the Barmah State Forest near Echuca in Victoria. In 2007, with the boys all pursuing careers away from the farm, Anne, with the encouragement of her sisters Carmel and Bernadette, decided to plant 360 pomegranates. She chose pomegranates as she wanted to plant a “superfood” crop that would help maintain and add to her family’s health and the health of anyone who bought them. The pomegranates were planted on a yellow sand hill with very poor soil fertility and structure and in some areas, very compacted. A previous owner had removed large areas of top soil from the paddock. The Phillips had difficulty growing a decent crop of oats on the paddock. It was well named the “disaster paddock”. Despite the past, Anne wanted to resurrect the paddock and she proceeded to hand-dig holes and plant bare rooted pomegranate stock into the soil. No ripping was performed before the trees were planted. Anne had a neighbour come in with a round baler who baled up some green pasture and then fed it out along the rows with his round bale feeder to provide mulch for the young pomegranates. Anne then pitchforked it around the trees. She also dug around the 360 pomegranates with a hoe to help hold the water close to the tree. The first two years, irrigation was done by hand watering each tree with 100 metres of garden hose. In late 2008, Anne’s 18 month old hand-fed Damara ram lamb charged her and butted her in the hip, causing an injury lasting to this day. The ram lamb is now dearly departed. Cameron, the eldest son, who was managing the exercise physiology lab at Southern Cross University (SCU), was called by his aunt Bernadette to see if he could return home to help out with the pomegranate project. In December 2008 he resigned from his role at SCU and returned home to the family farm. 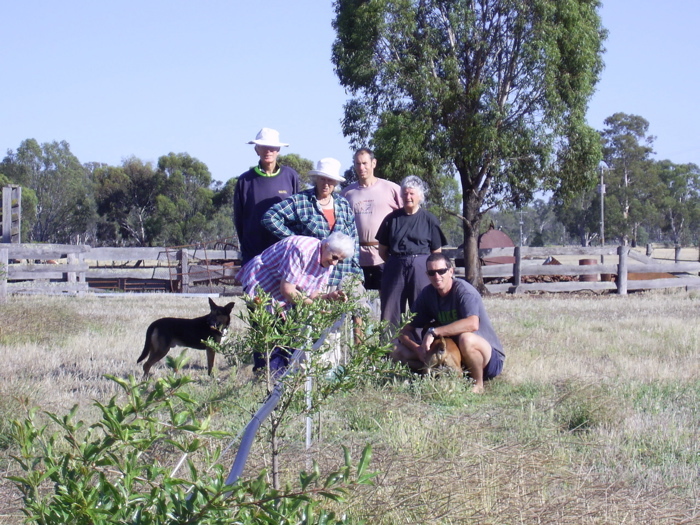 Late in 2009, Anne and Cameron decided to scale up the pomegranate orchard to 1500 trees, now totalling 4 acres. By early 2010, John was able to leave employment in Brisbane where he had been staying with Tim, who is their youngest son. The increase in tree numbers required a serious upgrade of the irrigation system and the Phillips’s followed Lynton Greenwood’s advice (Greenwood Orchards, Merrigum): 25mm polyethylene pipe was tied to a wire 60cm above the ground and 3000 tornado ray jets were placed either side of the tree for water delivery. Single wooden strainer posts were rammed into the ground at each end of the 120m rows to tie the wire off. The elevated pipe system keeps most ants out of the ray jets and allows brush-cutting under the tree without damaging water lines. As with the initial 360 pomegranate trees planted, the remainder were all hand dug and planted. It takes six days to completely irrigate the 2Ha orchard on 8 hour water changes. The pump which draws water from the Broken Creek can only push water to four 60m rows at a time. Water changes usually occur at 6am, 2pm and 10pm. Irrigation occurs fairly consistently from late September right through till the end of March or early April. This year irrigation ceased in the last week of March as some fruits were starting to split. Pomegranates are very prone to splitting if they receive a big rainfall when the fruit is close to maturity. The Phillips’s were concerned that one more irrigation may just encourage more splitting. The initial 360 trees that Anne planted were purchased from Lewis Horticulture in S.A. The remaining trees were purchased from the Heaysman Brothers of Comla farms at Mildura. Anne started the pomegranates at 5m row spacings and 4m tree spacing along the row. The new block has 6m row spacings with 2m tree spacing along the row. As the trees mature, the 2m spacing could end up being a little crowded, in which case they can be thinned. Pomegranates produce a beautiful orange flower from November through to March. It quickly loses its petals and transforms into the pomegranate fruit, which is ready for the first picking from late March through to April. The labour requirements for the Phillips’s pomegranate orchard include; slashing, suckering, pruning, electric fencing for sheep and cattle when grazing, irrigation changes, spraying 500, picking, packing and marketing. Contract operations have been one application of chook manure and one pass with a neighbour’s ripper. The chook manure spread in early spring 2013 helped with the spring and summer pasture growth between rows. The closest farmer with a ripper did not have the long sloping curve that is preferred by BD growers and was unable to penetrate some of the most compacted soil or would ride out of the ground when it reached the compacted areas. Slashing occurs through Spring and Summer with a four foot slasher on the back of an old grey Fergi. The Fergi is also used to spray out 500 through the orchard and over the entire farm in Autumn and Spring. The most labour intensive and back bending work is suckering, or cutting the new growth that shoots up from the base of the tree at least three times over the summer. Knee pads, secateurs, a lot of patience and a few stretches are required to get this job done. Some of the conventional growers just give the base of the tree a light hit with herbicide to deal with the sucker growth. Grazing sheep and cattle through the pomegranates has been done with some measure of success, and some loss. It is quite labour intensive to roll out 500m of electric fence wire up and down each row. One person can achieve the fencing change/cattle move in about an hour. The cattle mow the pasture and native grasses down very neatly, but also chew on the pomegranates if they get bored. This results in the electric fence wire being moved further from the tree and closer to the centre of the row and prevents the cows from chewing right up close to the base of the tree, which is ideal as it makes the suckering process much easier with a clean area around the tree. The sheep are quite ruthless on the pomegranates too - the Dorper breed stand up on their back legs to forage in the tree. Pruning takes place from June through to August. Cameron attempts to shape them into a wide vase shape with 3-5 main branches. According to Lewis Horticulture and DPI information, pomegranates ought to start yielding in their third year, and in an established orchard the same sources state that pomegranates can yield up to 25 tonnes per Ha. The Phillips’s only yielded a total of three fruit bins in 2014 and again in 2015. It was very obvious that soil improvement needed to occur before the pomegranates became an economically viable venture. Goals for the future include deep ripping with a machine such as the Fix Soil Rehabilitator, or at least a ripper with the long curved shanks that start the soil shattering process before the vertical part of the tyne is pulled through. A green manure mix will be sown to help build soil fertility and structure. Previously this has been done by hand broadcasting a clover mix through the orchard. The Spring clover growth has then been slashed back onto the ground. To really improve the green manure crop growth, a larger irrigation pump with a four inch pipeline supplying the orchard will be installed as the current system is unable to reach the centre of the row. Chooks have recently been added to the pomegranate orchard. One of Anne’s mobile chook sheds has been re-instated from her free range egg enterprise from the late 80s to the early 90s. Currently 40 hens and two roosters are scratching through the orchard. The mobile shed, on skids, has capacity for another 100 chooks. The chooks are free ranging, although they are confined and protected from foxes by two 50m feathernet portable poultry fences and some mesh across the end of the rows, between irrigation lines. It takes two people nearly two hours to wrap up the fences and re-erect them another 50m along the orchard. The mobile chook house is moved more frequently than the fences. Picking the pomegranates occurs from March through to April, usually in three pickings. The fruit is cut off the tree with secateurs and placed in a traditional fruit picking bag then tipped very gently into fruit bins. Lynton and Deb Greenwood very kindly let the Phillips’s store, sort and pack their pomegranates at Greenwood Orchards Cold Stores, Merrigum. In 2014 the first Greenwood Orchards Biodynamic Pom/Pear juice was bottled with 15% pomegranate juice from the Phillips’s orchard. The majority of pomegranate sales are at Melbourne Farmers Markets. Mark Rathbone, another well-known BD grower has also been very generous with his support and guidance. For the last few years on Saturday mornings through the months of April and May, you will find Cameron and sometimes Anne and John out the front of Mark’s Biodynamic farmers market stall selling whole pomegranates and freshly squeezed pomegranate juice. After packing up from the farmers market, the Phillips’s travel home via Terre Madre, Northcote and deliver their remaining pomegranates there. As the orchard matures and yields increase, the Phillips’s are developing a range of pomegranate products. The first will be to continue with Greenwood Orchards Pear-Pom Juice. A pomegranate cider and wine have been suggested and a friend is already experimenting with probiotic rich pomegranate kefir and kombucha drinks. Freeze dried pomegranate arils and pomegranate tea infusions are also on the development list. If they were to start all over again and had a bigger budget, what changes would they make? Slash the green manure crop in over the summer and as it re-grows. Set the irrigation lines at 1m high so sheep can pass under without rubbing on the water line. This would also allow the poultry feathernet fencing to pass under irrigation lines wherever required. Pomegranates contain Vitamins A, C, E and iron, and are a rich source of antioxidants, notably flavonoids and polyphenols, which protect against heart disease and cancer. Pomegranate juice has more antioxidants than red wine, green tea, blueberries or cranberries. Punicalagin, an important compound only found in pomegranates, helps the heart and blood vessels – it lowers cholesterol, lowers blood pressure and helps clear arteriosclerosis plaque. Other potent antioxidants reduce platelet aggregation and lower blood pressure. Pomegranates inhibit breast cancer, prostate cancer, colon cancer and leukemia, and prevent vascular changes that promote tumour growth. Pomegranate juice contains phytochemical compounds that stimulate serotonin and estrogen receptors, improving symptoms of depression and increasing bone mass. Strain out the water and eat the arils – some people spit out the seed but it is also edible, crunchy and high in fibre. Find a named variety and check to see if it suits your climate. Growing from seed produces variable results. Drought resistant but fruits better with some watering. Frost resistant as well. Best suited to areas with long hot summers and cold winters, but some varieties will produce good fruit in cooler southern parts of Australia, such as Melbourne. Fruit ripens March to May, but can be picked a little early and ripened in storage (particularly if rain threatens around ripening, as fruit can split).